Take your eco-consciousness to the next level with a solar oven. You hit the farmer’s market every Saturday morning, rain or shine. You buy in bulk. You season your meals with fresh herbs from your windowsill or garden. You compost your food waste. You minimize the meat on your plate, or even forego it completely. Congratulations—your ethical and informed choices not only keep you healthier, but reduce the carbon footprint of your food consumption, too. Now, how about an eco-friendly method to cook that food without wasting energy? Learn here how to make a solar oven. A solar oven costs nothing to operate, it requires not a trace of energy, and it’s always available. Each hour, the amount of sunlight that reaches us on Earth is enough to meet global energy needs for an entire year. We can harness its energy to power just about anything—our homes, our cars, and even our cooking. It’s easy to make your very own solar cooker, and the best part is that you probably have everything you need to build one lying around the house. 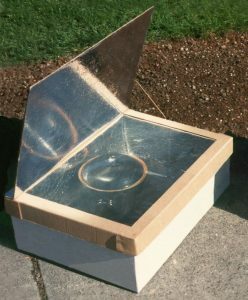 There are three solar oven designs—solar cookers, panel cookers, and parabolic solar cookers—and all rely on the same basic concepts of conduction, radiation, and convection. This tutorial is for a simple solar cooker, and it works the same way solar panels work on a larger scale—by collecting heat, which is then converted to energy. We’ll use cardboard, but you can substitute wood for a more durable alternative. It’s not nearly as quick as your kitchen oven, of course, but the box can reach temperatures of 200 degrees Fahrenheit, so think vegetables, grains, and desserts rather than a thick slab of steak. This oven is meant for more of a fun, sunny day experiment for curious minds of all ages, especially for kids. Just set out your plate, go about your day, and come back later to some tasty, sun-cooked food. Two large, shallow cardboard boxes. The larger (outer) box should be slightly taller than the inner box. The inner box should fit inside the outer box with a 1” or 2” space between the two when they’re nested. Make sure the inner box is taller than the dish you use for cooking. A loose piece of cardboard for constructing the lid. It should be six inches wider and longer than the outer box. Step 1: Create an insulation chamber, so that your inner box can nest inside the outer box. Turn your outer box upside down (with the flaps down), and center set the inner box on top. Trace around the shape of the inner box. Cut along those lines to make a window opening. You should now have a frame of 1-2” on all four sides. Step 2: Construct a lid (with a flap) to fit over the top of the bigger box. This flap will open, and that’s where you’ll set your plate of food to cook. Center your outer box on top of the loose cardboard piece and trace around all four sides of the big box. Now center the inner box inside of the lines you just drew, and trace around the inner box. Fashion your flap in the lid by cutting along only three sides (two short and one long) of the innermost lines. Now go back to the outer box that you just traced. Extend the lines from each corner of your larger traced box, drawing to each corner of the cardboard piece. Cut along these lines, fold them down (creating a 3D lid), and tape up around the box. Step 3: Line the box with foil to reflect sunlight into your box, and insulate with newspaper in order to trap heat. Glue aluminum foil, shiny side out, to line all five sides of the inside of the outer box, as well as the inside and outside of the inner box. Finally, cover the underside of the flap with foil, too. Fill the gap between the outer box and inner box with rolled-up newspaper sheets on all four sides, to the top. Duct tape a double layer of Saran Wrap (or Plexiglas) to the underside of the window. Secure black construction paper, which will absorb heat, to the bottom of the inside box. Step 4: Set up your oven. Make sure the foil-lined flap is reflecting light into the window, and reposition as necessary. Set your plate in the box, and prop the lid open with a stick or the wire hanger. If you’re heating liquids, stir often as with a regular stove. Step 5: Enjoy your scrumptious solar feast!